A quiet woman who once turned down a class valedictorian's medal because she feared public speaking, Lady Bird Johnson found herself pulled suddenly into the public eye as first lady when her husband Lyndon B. Johnson became president amid tragedy. When she died of natural causes at her Austin home Wednesday, at age 94, Mrs. Johnson was remembered as loving and gentle, yet strong in spirit and in her dedication to her family and her passion for nature. "America lost an extraordinary first lady and fine Texan," President Bush said. "She brought grace to the White House and beauty to our country." "Every American owes her a debt of gratitude because it was her devotion to the environment that brought us the Beautification Act of 1965 and the scenic roadside development and environmental cleanup efforts that followed," former President Bill Clinton and Sen. Hillary Clinton said in a statement. The Clintons also praised her for supporting her husband's "fights for civil rights and against poverty." Former President Carter said he and his wife, Rosalynn, remembered her "empathy for the disadvantaged. Many people's lives are better today because she championed with enthusiasm civil rights and programs for children and the poor." "During her husband's campaign for the presidency in 1964, she visited cities in the South considered too racially volatile for his presence," President Carter said. "She was President Johnson's full partner in the War on Poverty, including convincing him to implement the Head Start program and serving as its honorary chair." Sen. Robert C. Byrd, D-W.Va., who started in the Senate in 1959 when Johnson was Majority Leader, said of Lady Bird, "She was a woman of courtesy and courage alike. While her husband, Lyndon, could be brash, she was benevolent. While he could be tough and hard-charging, she epitomized style and grace. Together, they were a formidable pair." "Mrs. Johnson was a true, strong Texas woman," said family friend and spokesman Neal Spelce, comparing her to historic Texas political women like Ann Richards and Barbara Jordan. "Mrs. Johnson personified that strength, but yet she did it with a very genteel, gracious, quiet, soothing exterior." She joined in every one of her husband's campaigns and rarely lost her composure, despite heckling, grueling campaign schedules, and her fear of public speaking. She once appeared for 47 speeches in four days. Mrs. Johnson said her husband "bullied, shoved, pushed and loved me into being more outgoing, more of an achiever. I gave him comfort, tenderness and some judgment — at least I think I did." She was her husband's chief supporter when he challenged John F. Kennedy unsuccessfully in 1960 for the Democratic presidential nomination, although she confessed privately she would rather be home in Texas. Her husband eventually became vice president. The Johnsons were propelled into the White House with the Nov. 22, 1963, assassination of Kennedy in Dallas. "President Johnson once called her a woman of 'ideals, principles, intelligence, and refinement.' She remained so throughout their life together, and in the many years given to her afterward," President Bush said. Others remembered Johnson on Wednesday as deeply devoted to her family and the environment. Nancy Reagan said that when Lyndon Johnson was called upon to take the oath of office after Kennedy's assassination, "he did so with his courageous wife beside him." She said Lady Bird Johnson served the nation with honor and dignity. Mrs. Johnson spent 34 years in Washington while her husband held the offices of congressional secretary, U.S. representative, senator, vice president and president. Faced with growing civil unrest and challenges from within his own Democratic Party over his Vietnam War policies, Johnson declined to seek re-election in 1968. After leaving Washington, the former first lady worked on "A White House Diary," published in 1970. She also served a six-year term starting in 1971 as a University of Texas regent. The former president died in 1973, just four years after leaving office. She was hospitalized with a stroke in 2002 that made speaking difficult. But she continued to make public appearances and in May attended an event at the LBJ Library and Museum. Along with tenaciously supporting his administration, she was a champion for the environment and the preservation of native plants and wildflowers. Despite her medical setbacks, she occasionally visited the Lady Bird Johnson Wildflower Center she co-founded in 1982 and delighted in the wildflowers around Austin's Town Lake. "I'm optimistic that the world of native plants will not only survive, but will thrive for environmental and economic reasons, and for reasons of the heart. Beauty in nature nourishes us and brings joy to the human spirit," she once wrote. Born Claudia Alta Taylor in the small East Texas town of Karnack, Johnson received her nickname in infancy from a caretaker nurse who said she was as "pretty as a lady bird." It was the name by which the world would come to know her. She disliked it, but said later, "I made my peace with it." At the University of Texas in Austin she studied journalism and took enough education courses to qualify as a public school teacher. She received a bachelor of arts degree in 1933 and a bachelor of journalism in 1934. The couple had two daughters, Lynda Bird, born in 1944, and Luci Baines, born in 1947. The couple returned to Texas after the presidency, and Mrs. Johnson lived for more than 30 years in and near Austin. 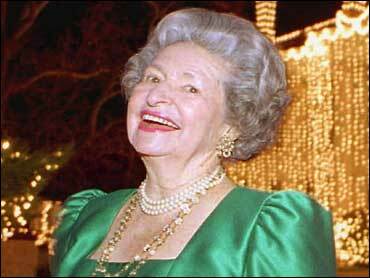 In addition to her two daughters, Lady Bird Johnson's survivors include seven grandchildren, a step-grandchild and several great-grandchildren. She will lie in repose at the LBJ Library and Museum from 1:15 p.m. Friday until 11 a.m. Saturday. A private funeral service will be held Saturday afternoon and she will be buried in the Johnson family cemetery.